Mixing Media – Stucco, Stone and Tile Sign in Faux. We offer design to delivery of stucco stone tile sign monument projects nationally! This customer wanted a unique entrance sign monument for their senior living community. Everyone on their Board wanted something different, so we mixed them all in a design that complements the architecture of the buildings. The base is faux rock we produced from photography of stones that are native to the area. This board member we to a local paint store and pulled color swatches of the stone. After four colors were matched, the color name and color code was emailed to us for our artists to match in production. Another board member wanted decorative tiles embedded in the side columns. We could have matched the design, but the customer was particular about them being an exact match to the entrance gate. The solution was simple – several of the times were shipped to us and we installed them in recessed areas as shown. We sealed the grout and it’s all good to go! Another board member wanted a very script typeface, so our design dean developed a new logo using a southwestern color pallet. Once completed, we exported the logo for their use on the community newsletter and all print collateral. Some of our designers have vast experience in commercial printing, other on our team are fluent in web and interactive media. In any case, we are here to help! We have fine-tuned every aspect of made-to-order stucco stone tile sign monument projects. You will be in touch with an experienced sign designer, seasoned in cost-effective solutions. We listen to your needs and deliver! 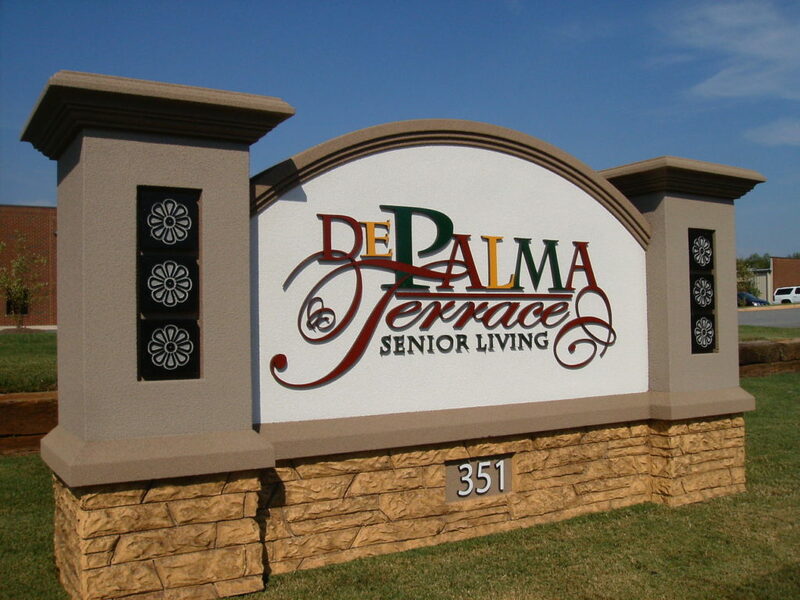 Custom stucco stone tile sign monument signs provide a sense of distinction and permanence to your property. Our sign monuments are the style most desired and required by municipalities nationwide for an all over better looking community. With over (2) decades of nationwide success, we will make You Look Your Best! We welcome any challenge in custom stucco stone tile sign monument designs, and can produce anything you can imagine! Please use our online contact form to start your next sign project. We look forward to working with you!